Parallax Shifts: In Search of Imagined Landscapes is a body of work by London-based artist Sam Nightingale that address issues of cultural geography, myth and the representations of place and history in the American Southwest; a project that he undertook during an artist residency in the High Chihuahuan Desert, Far West Texas. Nightingale’s practice reveals the multiple histories of cinematic spaces both real and imagined. Building on various projects that enliven cinematic spectral spaces, Parallax Shifts: In Search of Imagined Landscapes…comprises four distinct but related series of photographic images that engage with the violent frontier history and landscape of the borderlands in the High Chihuahuan Desert during the nineteenth century and the imagined version this took in the Spaghetti Westerns that were filmed in the deserts and foothills of Spain and Italy during the 1960/70s. Between 1962 and 1979 over 490 Spaghetti Western films were produced. These films were made in the deserts and foothills of Spain and Italy, but conjured or imagined the desert landscape of the American West: a frontier where anything could happen. Hollywood pictured these epic landscapes as symbols of modernity through the quintessential westerns of John Ford and Howard Hawks and in the acting of John Wayne. However, vast differences exist between these two genres of ‘westerns’. The Hollywood Western was frequently based on a hyper-romanticism that privileged the past, while the Spaghetti Western was steeped in a radical politics that was trying to comprehend the present, made during a period when Italy and Spain were still battling to emerge out of a history of fascism. The Hollywood Western was often depicted a poeticised vision of the West: morality was certain and it was a place where the good, the bad and the ugly would battle but the good guy was always sure to win in the end – getting the girl, the gun, the gold, etc. The Hollywood Western showed life as sacred and to be protected, in contrast, life in the Spaghetti Western was a worthless commodity to be used up and thrown away. Chaos ruled in this landscape where the social order that seemed so certain in the Hollywood version was turned on its head. A land that was shown as stable and conquered, on the one hand, became a hostile desert where only the violent could survive – a nihilistic landscape where violence needed no reason. Yet increasingly, the Spaghetti Western also relied on the landscape that the Hollywood Western perceived and pictured – an ‘imagined geography’, to evoke Edward Said – if only as a way to position itself in opposition. 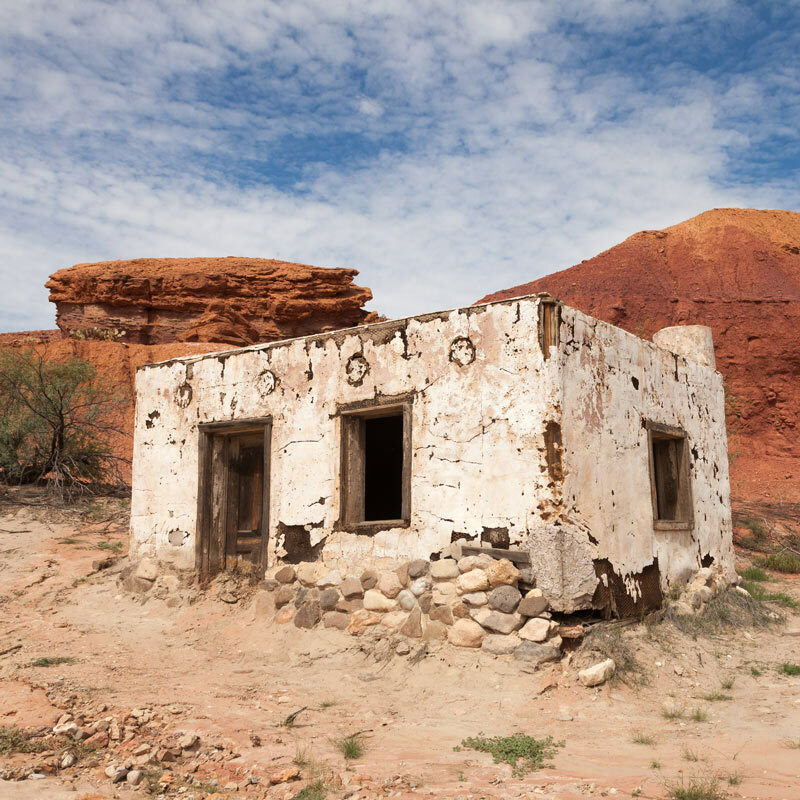 The relationship between these two western genres is complex in regard to the picturing of desert regions of the American Southwest, and is one that involves mirroring, parallax views and displacement. 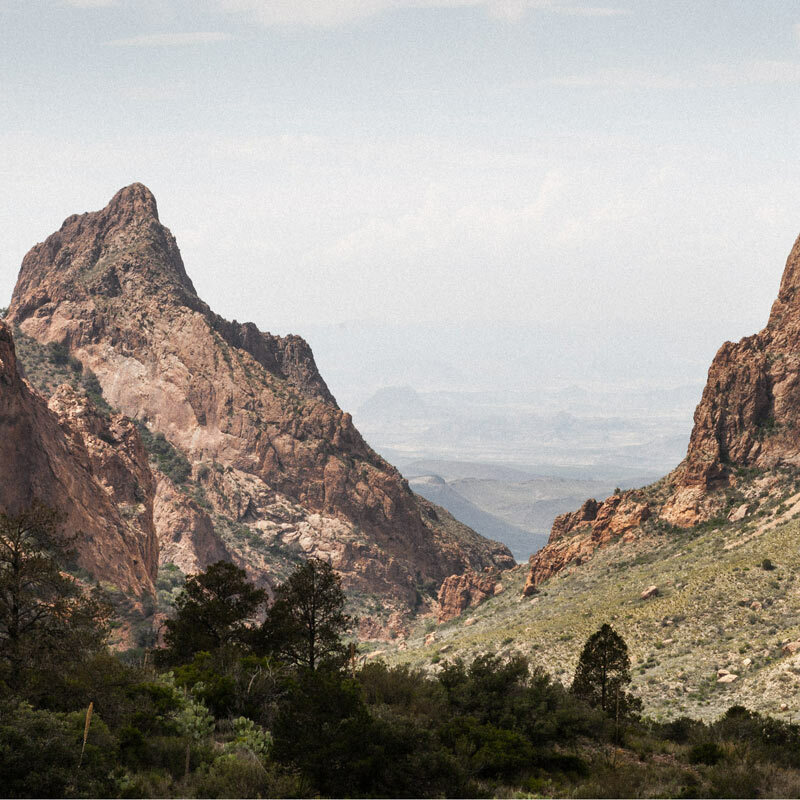 It is this complex relationship between the desert landscape that is imagined in the Spaghetti Western and the landscape depicted in the Hollywood Western that Sam Nightingale researched and experimented with while he was the A Brooks Art invited Artist in Residence in Marfa, Far West Texas in 2014. 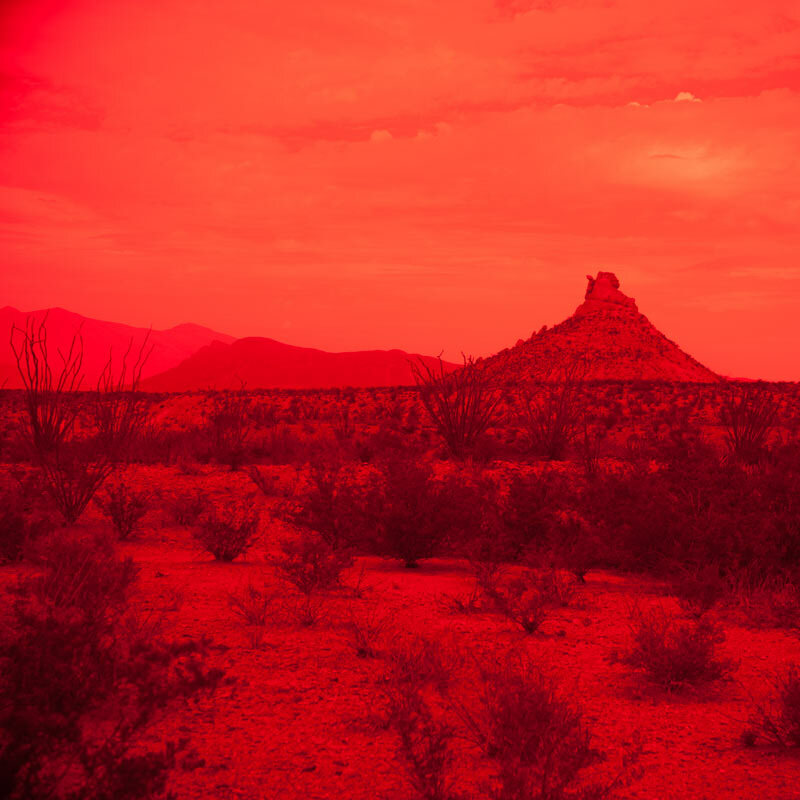 Working in and responding to the High Chihuahuan Desert – an area close to the border with Mexico and charged with myth and fantasy that the era of Spaghetti Western films sought to imagine and disrupt – Nightingale undertook a creative investigation by going in search of his own versions of these depicted terrains. For Nightingale, theses are sites of indeterminacy (spatially and temporally), having grown up watching Spaghetti Westerns in the cinemas of England, they were landscapes imagined from multiple ‘elsewheres’. 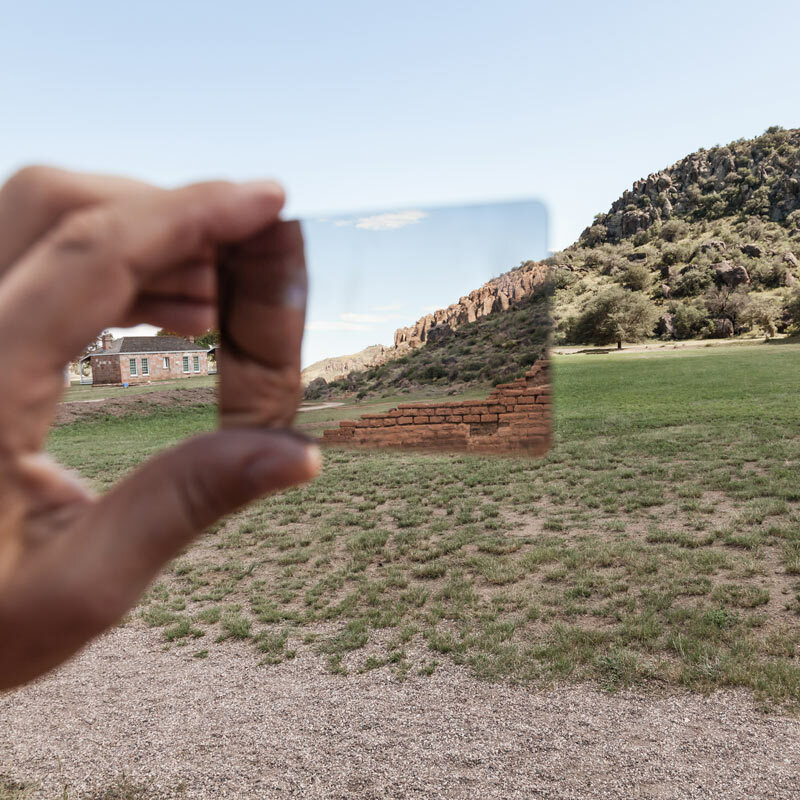 Taking the idea of a ‘parallax shift’, which displaces an image slightly when looking through certain types of lenses or mirrors, his creative endeavour was to imagine the ‘imagined’ that he had seen in the Spaghetti Westerns films. Nightingale evokes these imaginings photographically in Parallax Shifts: In Search of Imagined Landscapes as three distinct but related sets of photographic images, that he produced through a process of artistic experimentation: journeying into the desert, exploring ghost towns that no longer exist (or never existed), discovering abandoned film sets and making interventions into the image to reveal parallax shifts.